I love a day at the beach or sitting by a pool but can’t stand having oily hair, a sweaty face or sunburnt skin so I’m always looking for the most effective summer beauty products. 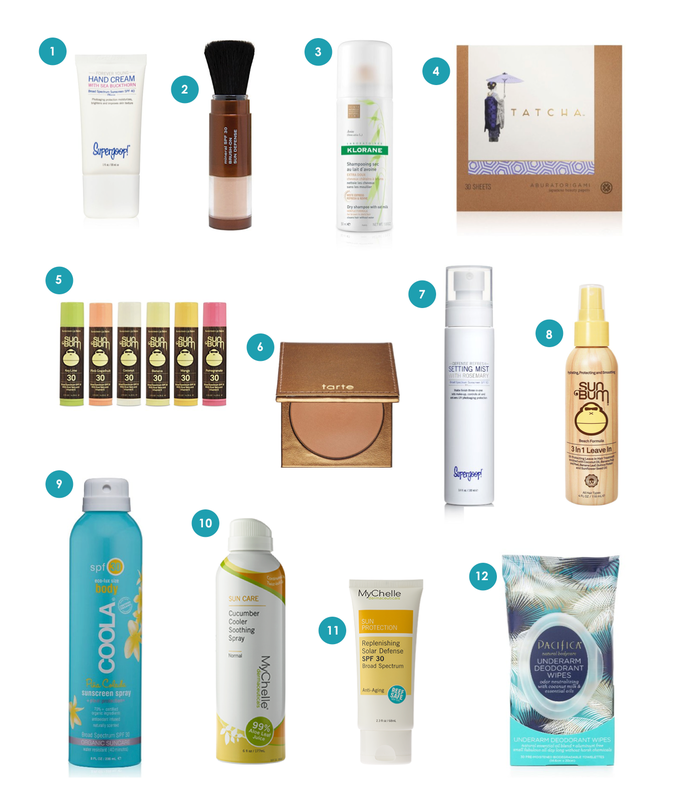 These are my favorite beach beauty essentials. Hydrating leave-in conditioner, age-defying hand cream, waterproof bronzer, my secret for an oil-free face in seconds, an ingenious underarm product and more! All vegan and cruelty-free, of course! This is my favorite summer hand cream. The subtle scent is delicious, it absorbs quickly and brightens and improves skin’s texture! The small size is perfect for throwing in your beach bag. In addition to my liquid face sunscreen, I always use a brush-on powder sunscreen for touch-ups and to control shine. This power is antioxidant-infused with sea kelp and white tea! This is my absolute favorite dry shampoo. It quickly absorbs excess oil and restores bounce after a long day at the beach. I use the tinted version but they also offer their original clear dry shampoo! These are the best blotting papers I’ve ever tried! I always carry a package in my purse during the summer. The sheets are made of 100 percent natural abaca leaf and gold flake. They’re as pretty as they are effective! This vegan lip balm is made with moisturizing cocoa butter and comes in so many yummy flavors. Flavors pictured: key lime, pink grapefruit, coconut, banana, mango & pomegranate! If you’re protecting you’re face like me, you’ll need a bronzer to give your cheeks and forehead that perfect summer glow. This bronzer contains vitamins A, C, and E and even contains water to help your skin retain moisture! This three-in-one mist controls oil throughout the day, sets makeup and provides UV photoaging protection. I love the fresh rosemary-mint scent! This lightweight leave-in spray smells amazing. Like one Amazon reviewer put it: “this product smells like your childhood summer at the beach”! It conditions and protects with coconut oil, argan oil, sweet almond oil, sunflower seed oil and banana leaf. This hydrating sunscreen is made with organic ingredients like cucumber, algae extract, strawberry extract and red raspberry seed oil. It sprays on evenly and smells incredible! Want higher SPF? Try their unscented SPF 30 sport sunscreen spray! Soothe, cool and hydrate your skin after a day in the sun with this cucumber and aloe spray! Made with all-natural, non-GMO ingredients. This is such an amazing anti-aging sunscreen for your face. It protects, moisturizes and reduces lines with plant-based ingredients like zinc oxide, red algae extract, kukui oil and macadamia nut oil! This ingenious product by Pacifica wipes away underarm sweat, neutralizes odors and soothes with coconut milk and essential oils.